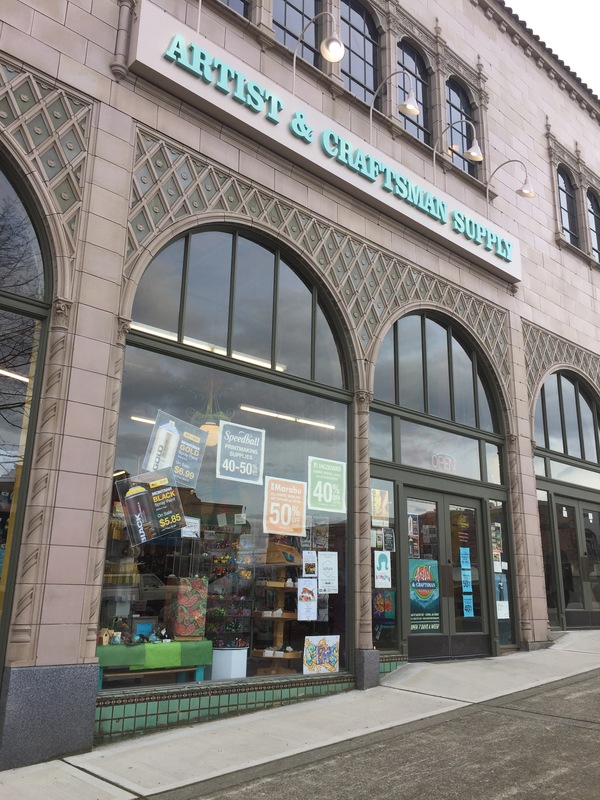 The Artist & Craftsman Supply Store at 612 St. Helens in the Antique Row area of Tacoma opened in November 2016. Dear husband and I finally made our way down there and really we were very impressed. Dear husband has been in many an art supply store, but he declared this to be the best stocked that he has ever seen. We picked up some Easter basket stuffers, a book, some paint and some photo-transfer sheets. The staff was friendly and knowledgeable and I’m positive we’ll be back. Artists & Craftsman is an employee owned company with many stores, mostly along the country’s coasts. There is a website for the company. The Tacoma Artist & Craftsman store has a Facebook Page with information on upcoming events and sales. Educators receive a 10% discount. The building, constructed in 1928, was originally the Wagner Motors Building with Silas E. Nelsen as the architect. It was the dealership for Studebaker – Erskine. It continued to have an automobile orientation until 1949 when it became a carpet distributor. I remember it being the Mandarin Antiques Store. Artist and Craftsman occupies most of the lower level of the building. Update one week later. It finally stopped raining for a few minutes and I got a photo of the outside of the building. This entry was posted in Art -- there is art here!, Stores and other places that sell you things, Tacoma, Unique Shopping (stores with some personality), WA State - Pierce County and tagged art, artist, Artists & Craftsman, crafts, Erskine, Mandarin Antiques, Silas E. Nelsen, Silas Nelsen, Studebaker, supply, Wagner Motors on March 26, 2017 by admin.